Not sure how this depicts The Tower? Click here. Etteilla: Misery, Distress, Poverty, Catastrophe, Death, Imprisonment, Awakening. Lévi: The hieroglyph is a tower struck by lightning, probably that of Babel. Two persons, doubtless Nimrod and his false prophet or minister, are precipitated from the summit of the ruins. Christian: The Tower is the symbol of material forces that can crush great and small alike. It is also the emblem of rivalries which only end in ruin for all concerned; of frustrated plans, of hopes that fade away, of abortive enterprises, ruined ambitions and catastrophic deaths. Papus: The Tower signifies the invisible or spiritual world, incarnated in the visible and material world. This card represents the material fall of Adam. Felkin: The tremendous destructive influence of the lightning, rending asunder established forms to make way for new forms to emerge, revolution as distinguished from transmutation or sublimation, the destructive as opposed to the conservative. Wirth: There is a risk in rising too high; we are warned of by this the thunderbolt from the Sun which takes the top off the Tower. The Sun here is a symbol of Reason which governs men and is opposed to their extravagant ideas. May our pride be humiliated before the Wisdom of the Tarot! 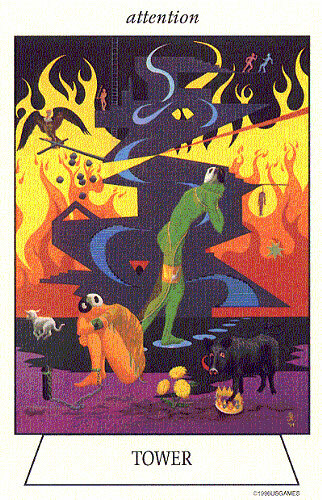 Illustration (right): The House of God from the Oswald Wirth Tarot Deck, adapted from the work of Wirth (1889) (copyright &COPY; 1976 U.S. Games Systems). Click the image for a larger one. Case: In terms of consciousness, the lightning-flash symbolizes a sudden, momentary glimpse of truth, a flash of inspiration which breaks down structure sof ignorance and false reasoning. The crown knocked from the tower by the lightning-flash is the materialistic notion that matter and form are the ruling principles of existence. Crowley: To obtain perfection, all existing things must be annihilated. The destruction of the garrison may therefore be take to mean their emancipation from the prisonof organized life, which was confining them. It was their unwisdom to cling to it. Gray: Overthow of existing modes of life. Conflict, unforseseen catastrophe. Old notions upest; disruption that may bring enlightenment in its wake. Selfish ambition about to fall, bankruptcy. Sadhu: The complicated way of bringing about transformations in the development of the universe sets in motion an instrument called Fate which, with the help of the physical reactions belonging to the bonds in a state of tension, preserves some forms and at the same time destroys others. 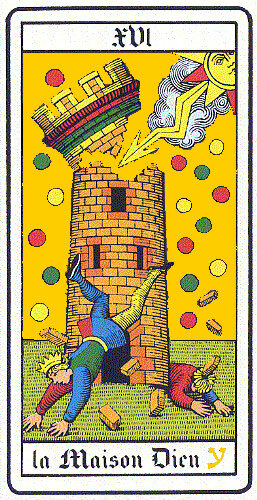 ONeill: To the Gnostic or Neoplatonist, the image on the Tower card would immediately bring to mind the fall of the soul into matter. The symbols of the duality which entrap the fallen soul are shown on the card as a falling man and woman. Notice that the force which is hurling the victims down is a heavenly force, the force of the archons. Pollack: When the Tower appears it is necessary to remember that it can lead to freedom; the explosions are clearing away some situation that has built up intolerable pressure. They can lead to new beginnings. Turk: Realize that your conception of the truth is never the same as other peoples truth, and acept this. Separate truths are fabricated by our egos in their attempt to produce effects in the world around us. Towers of false convictions divide us both inwardly and outwardly, and in order to understand eath other, we must demolish them, brick by brick. 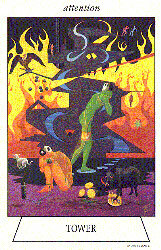 Illustration (left): The Tower from Navigators Tarot of the Mystic Sea by Julia A. Turk (copyright &COPY; 1996 U.S. Games Systems). Click the image for a larger one. Symbol (top): It is best viewed sideways and depicts a lightning-struck tower.